Hello friends. I recently went to my Tuesday crochet club meeting at my church, and I learned a new crochet stitch! I taught a lady that joined our crochet group how to crochet. 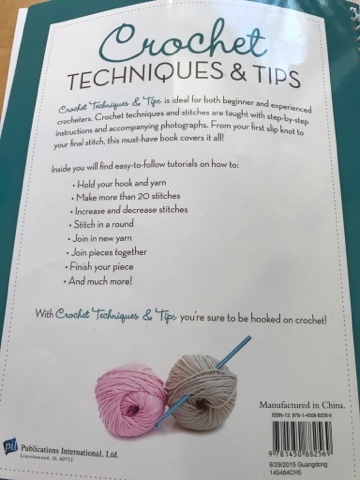 She also learned how to crochet by using this crochet book shown below, and by looking at YouTube video's which featured different crochet stitches. My friend was so eager to learn how to crochet and was so inspired by it. At our crochet club meeting, my friend happened to be making a crocheted scarf using the seed stitch (link with tutorial on this stitch). I was so inspired to learn the seed stitch and make a scarf like my friend did. So she gave me this book to keep. 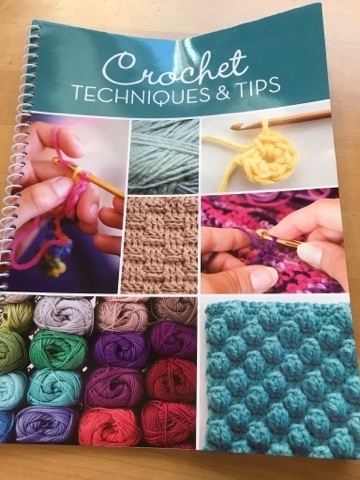 Inside this book has easy to learn step-by-step tutorials on different crochet stitches. I'm so eager to learn other stitches that are inside this book. I started making a crochet scarf using the seed stitch. Below is the start of the scarf that I will be donating to our crochet sale we have each fall at my church. The yarn I used for this scarf is: Red Heart Super Saver in the color Shaded Dusk. To make seed stitches, you need to start with a foundation chain that has any odd number of chains. To see a tutorial on how to crochet the seed stitch you can click HERE. The seed stitch is also a very good crochet stitch to use to make dishcloths. Have you learned any new crochet stitches? Thanks so much for stopping by for a visit. I hope you all enjoy the end of the week and weekend. Jess and I will see you back here on Monday for our Cooking and Crafting with J & J Link Up! Wow this is so cool! I haven't learned any new ones in a long time! Beautiful colors and pattern! 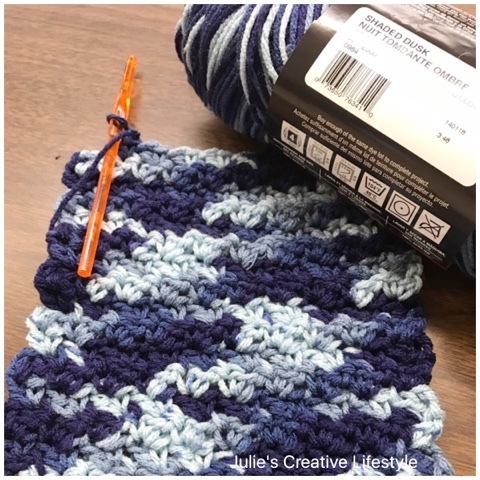 I usually use the ripple shell stitch when crocheting afghans. When I finish the one I'm working on a I don't like to try an new pattern so this book may be helpful. Thanks for sharing. Looks like a nice textured stitch! Thank you for sharing! It's a beautiful stitch, my friend, and I just love the color of yarn you used. It's always fun to learn a new stitch! And they usually turn out to be easier than they look. The yarn you used is so pretty. This is so pretty Julie. I have tried crocheting but it's always lopsided! I have a hard time with following instructions. It's a wonderful skill though and how nice that you can teach others too! Have a a lovely weekend. I'm going to take a knitting class tomorrow. Wish me luck! So pretty! Love the color of the yarn. Your projects always have me wanting to learn. Someday! Have a great weekend. Wonderful new stitch. Crocheting is not my thing, but I so appreciate your talents. It is amazing what you can make. Happy Saturday. This is so pretty Julie! I will check out this stitch! I recently made a baby blanket with a cupcake stitch border, it was so much fun! I'm trying the tulip stitch now...I found them both on Pinterest. Your crochet group sound like fun! That turned out wonderfully, Julie! Beautiful colors, too. 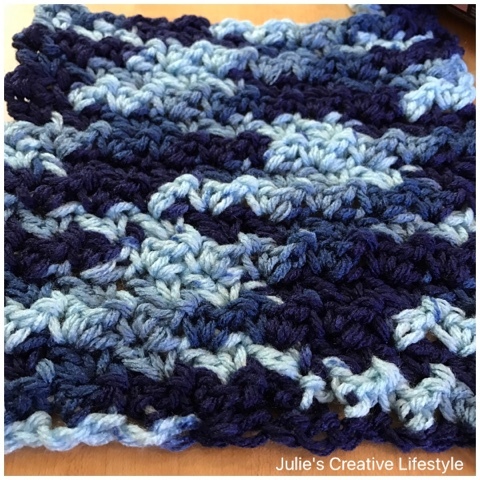 I would love to learn to crochet, Julie, and I'm feeling very inspired by your pretty scarf! I had not heard of seed stitch but it has a really nice texture. Thank you so much for sharing this post with us at Hearth and Soul. That is beautiful! I'm quite new to crochet and can only do a few basic stitches, I'm looking forward to learning some more! I don't think I have ever seen a stitch like that.... I love it!!! It looks really pretty, especially with that yarn. that stitch is new to me too, but now I need to research it. Thank you for joining The Really Crafty Link Party this week. Pinned!